"But what if, say, someone swallows the battery of an elderly lady's pacemaker and she'll die in thirty seconds unless someone recovers it?" "Again, no! 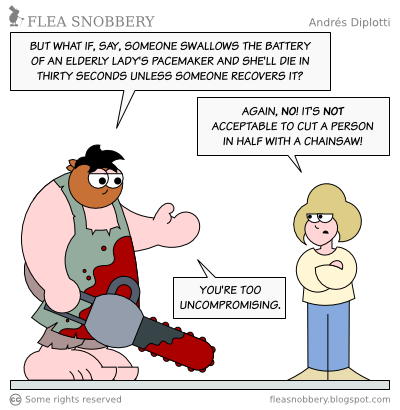 It's not acceptable to cut someone in half with a chainsaw!" Comments welcome. Please use a name or moniker to identify yourself. Spam and off-topic comments need no apply. Flea Snobbery is licensed under a Creative Commons Attribution-Noncomercial-Share Alike 3.0 Unported License.